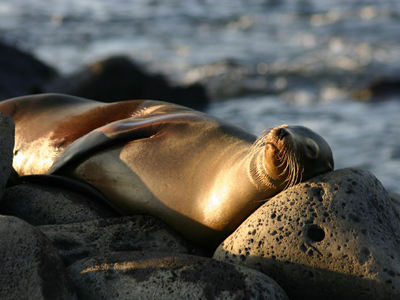 The Galapagos Islands feature an extraordinary sanctuary where people and wildlife peacefully coexist. This seven day land based adventure is a captivating way to experience the wildlife wonders and epic landscapes, while practicing sustainable tourism and preserving the natural heritage. You will be whisked away on an unforgettable exploration through the islands of Santa Cruz, Bartolome, Floreana and Isabela, accompanied by expert local guides. They will ensure you get the most out of every day, as you cover the highlights and hidden treasures. Encounter the fascinating wildlife, admire the unique landscapes and enjoy extraordinary lodges. 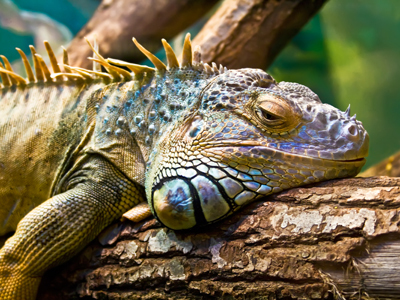 Combine this itinerary with a few nights on mainland Ecuador before and after your island escape, for the ideal blend of relaxation, nature and discovery. Welcome to the Galapagos! Upon arrival at the Baltra airport you have to buy the Migration transit card which cost is USD 20 per person (cash only) and the National Park Entrance Fee: USD 100 (cash only). You will then be met by your expert local guide in the arrivals area (he will be holding a sign with your names on it). The first stop will be the special VIP lounge to get changed for your transfer to the Itabaca Channel, where you will have your first opportunity to explore the beauty of the Galapagos Islands while kayaking! Stand up paddling and snorkeling are also possible for the first hour before switching to kayaks. 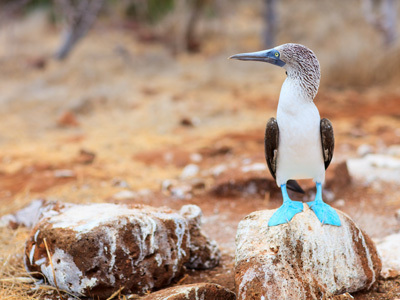 The unique turquoise colored waters are home to some of the most amazing wildlife in the Galapagos and will captivate your imagination and encourage you to become a true fan of this paradise. 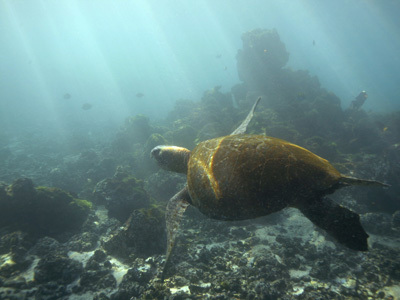 Stunning wildlife can be seen throughout this introduction to the Galapagos including sea lions, blue footed boobies, brown pelicans, lava herons, great blue herons, white-tipped reef sharks and more…and you'll see many of them as you kayak over the northern flank of the St. Cruz Island towards the Punta Carrion area. You will glide through amazing red mangrove forests, lava rock cliffs and crystal clear water. You will have a choice of either single or double ocean kayaks (sit on top kayaks with comfortable seats). Paddles, life jackets and a safety support boat will be provided for you. Average paddle lasts between 1.5 hours to 2 hours depending on the activity of fauna and skills of the kayakers. From the Itabaca Channel, you will head to the Santa Cruz highlands, where the exclusive giant tortoise reserve and tented camp is located, perched high on a hillside overlooking the Pacific Ocean. The Galapagos Magic Tented Camp will be your home for the next two nights. The sounds of nature will be your lullaby in the evenings, and you can feast your eyes on the scenic tapestry of mountains and forest surrounding the lodge and fantastic views of the ocean. On a perfect day, you can spot Floreana Island in the distance. Giant tortoises will be your companions at the lodge, and starlight will guide you to your rooms after a sumptuous dinner near the crackling fire. After dinner, explore the natural lava tubes on the reserve and enjoy a glass of wine or beer in the one-of-a-kind Lava Lounge built inside a lava tube! This is a truly special and unique place to relax around the fireplace and share stories from the day’s Galapagos adventures! Today after breakfast, you will head back to the Itabaca Channel to continue your National Park and Marine Reserve exploration. Your yacht, the Sea Finch, has operated since December 2010 from is based in Puerto Ayora. The Sea Finch carries a total of up to 16 guests, who can enjoy the air-conditioned dining lounge, as well as various outdoor sitting areas with beautiful views of the Islands. The Sea Finch, built in the United States, was chosen for its solid construction and comfort and it's fiberglass hull, which makes it a fast-cruising yacht. It has a total length of 18,00 meters and a beam of 5,06 meters. The Sea Finch will deliver you to Bartolome Island, which offers one of the most dramatic views in the Galapagos Islands. 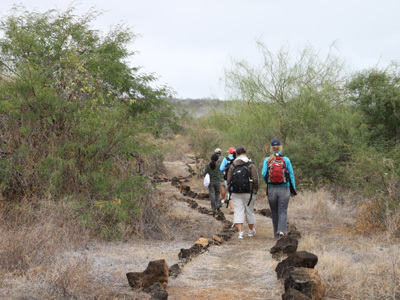 A 600 meter pathway can lead you to the highest point of the island, where you will learn from your expert naturalist guide about the volcanic origins of the Galapagos. After the walk, a dingy ride along the coastline will give you the opportunity to see the Galapagos penguin. This curious bird nests among fissured lava flows and ventures into the crystal-clear waters of Bartolome to fish. A wet landing in the main beach of the island will give you the opportunity to enjoy the sandy beach where sea lions rest and a variety of wading birds feed. The area has tranquil waters, offering a great snorkeling experience where you can observe tropical fish, sea stars and perhaps even see penguins under water. For those who are interested, you can make a late visit to the Charles Darwin Research Center, where you will learn about the Darwin Foundation's conservation efforts in the Galapagos National Park. This is where the world famous Lonesome George used to live. You’ll also spend some time in town, having a drink and walking along Pt. Ayora’s main road with it's nice little boutiques, before having dinner back at the Galapagos Magic Tented Camp. Floreana Island is home to the Galapagos’ smallest human population, only 150 people, and is also the least developed and most natural of the four inhabited islands. 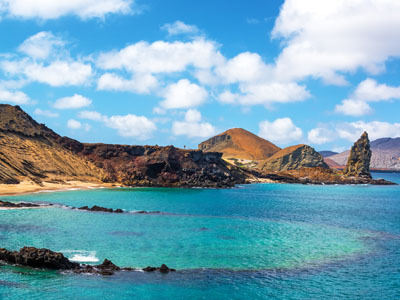 Once a pirates’ lair, Floreana was the first inhabited island in the Galapagos and descendants of the original population still live here amid the mysterious tales and legends that surround their ancestors. On Floreana today, you will have the chance to enjoy hiking, learning about the fascinating history of the local people, and seeing some of the Galapagos special wildlife (giant tortoises, frigate birds, Darwin's finches, sea lions, and petrels). You leave Santa Cruz early in the morning for a 2 hour speed boat crossing to Floreana. Upon arrival, you check in at the lodge overlooking the Galapagos’ most beautiful and secluded bay. After getting settled, you can walk or paddle (kayaks or stand up paddle boards) to the nearby Black Beach for some snorkeling. Lunch will be served at a local restaurant that is part of a community tourism initiative program. In the afternoon, you will embark on the kayaks or stand up paddle boards and cross the Bay in front of the lodge to explore La Loberia (a sea lion breeding ground), where you will enjoy more snorkeling and swimming in the warm, calm and bright water with sea turtles, sea lions, spectacular rays and lots of shimmering fishes. Later, you will return to the lodge, either by walking or paddling, for a nice warm shower and to celebrate another incredible day in the Galapagos with a perfect sunset. Dinner will be at a different local restaurant in the village. Weather permitting this evening, you may want to join in on the sparkling star gazing activity, before a great night's rest at the Lava Lodge. After breakfast this morning, you will leave to explore the Floreana highlands on your open-air bus (chiva) - an unbeatable, historic, and comfortable way to see the island. On the way, your naturalist guide will point out the wildlife and give you an idea of the colorful history of some of Floreana's first inhabitants, such as the Wittmers (whose descendants still live on the Island), the ‘Baroness,’ and the pirates that once visited here. They will also tell you about the "Enigma of Floreana," involving the mysterious deaths of several of the Island's inhabitants, a riddle from the 1930’s that has never been solved. After driving into the highlands, you reach Asilo de la Paz (Peace Haven) where your hike begins. You will walk up to this historic site, explore the pirate caves, and visit the freshwater spring that provides water for the entire Island. Along the way, you can expect to see giant tortoises lumbering around in the vegetation or even on the trail. You will venture through a rural area where the local people grow produce for their own consumption. This is a fascinating example of how these island people survive in this remote place and how over the years were able to develop an understanding of the local environment and now work to preserve their unique agricultural knowledge. On your way back to the coast, you will make a stop at a local farm, La Primavera, where you can watch the extraordinary behavior of the frigate birds who ‘dance’ as they wash their salty wings in the fresh water lake on the farm. With a little bit of luck, you may be able to see males puffing up the red pouches on their chests in an attempt to attract females. From La Primavera farm, you will continue by chiva down towards Cerro Allieri and the best view point in the islands and then to Las Palmas, where the Island’s first permanent inhabitant, the eccentric Dr. Ritter, lived and is buried. Arriving in 1926, the German physician believed that with a combination of exercise and the right vegetarian diet he would live to be 150 years old. He didn't, but his story is one of the many strange legends that still abound on the island. On the way, you will see spectacular views of the Floreana shoreline. Back at the lodge, you will enjoy a very special barbecue lunch, featuring a special family recipe lemonade with lemon grass family. After lunch, you can choose to practice your kayak or SUP skills, go snorkeling in La Loberia or simply relax and take in the beautiful Galapagos views from the Lava Lodge. Dinner will be at a local restaurant in the village. Today, you will head off on an early morning speed boat transfer to Isabela Island, where you will check into your hotel. After getting settled, your adventure begins with a tour of the Tintoreras, a group of small islands near the village of Puerto Villamil. The islands are named after the white tipped ‘Tintoreras’ reef sharks that swim in these calm waters. On Tintoreras, you will see almost all of the archipelago’s iconic wildlife: white-tipped reef sharks, sea lions, turtles, rays, penguins, and of course, pelicans and blue footed boobies. It’s like all of the Galapagos varieties in one! After walking on the island, you will have a chance to snorkel in the bay. Don’t be surprised if some of the penguins or sea lions jump in to play alongside you in the water! In the afternoon, you bike the Wetlands Trail, where you can see marine iguana colonies and a number of different types of mangrove trees (all four can be seen here). as well as enjoying the network of trails, beaches and historic sites. At the end of the trail is the Wall of Tears, built in the late 1940’s by Second World War prisoners held at the US base on the islands. Your guide will explain to you the importance of this site, offering a glimpse into the lives of the island’s previous inhabitants. On this network of trails, you will catch some beautiful views of the village below and will have the chance to see birds and, maybe even some wild giant tortoises. At the end of your ride, you will return to your accommodations to freshen up, before heading into the heart of Puerto Villamil for dinner. Volcanic eruptions created all of the islands in the Galapagos, and today you will get to see this geologic process first-hand, as you explore Isabela. 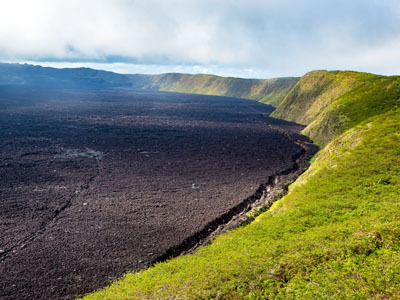 This island is one of the youngest and most volcanically active islands of the archipelago. You will have the whole day to explore the Isabela highlands, beginning with a hike up to the crater of the massive Sierra Negra Volcano, and then onward to the rim of the Volcan Chico. This fascinating walk usually begins with some morning fog and drizzle, which sometimes persists in the shadow of the volcano, adding to its mysterious character. Despite the weather, you may see see Galapagos hawks, finches, flycatchers and short-eared owls en route. When you reach the rim of the Sierra Negra crater, the second largest in the world after the Ngorongoro in Tanzania, you will truly be rewarded for your efforts. The crater is so large, and the views so expansive, that photos simply cannot do it justice, but bring your binoculars and camera anyway! Later, as you head towards Volcan Chico, you might get the feeling that you are walking on Mars, because of the alien-like landscape. While it appears to be utterly desolate, a closer look reveals small lizards scurrying among the rocks. From its rim, you will enjoy more amazing views along with lava tubes and fumaroles. After Volcan Chico and its extreme landscape, you will have some time to relax under the shade of a lovely “jaboncillo” tree and enjoy a delectable picnic lunch, while taking in the spectacular and expansive views over the central and northern parts of Isabela Island. In the distance, you will even be able to see Fernandina, Pinzon and Santa Cruz Islands. On a satisfied and happy stomach, you will head back down the trail, to complete your day of hiking (16 km in total) and relax on the beaches of Puerto Villamil...a well deserved slice of paradise! Sadly, the time has come today to take an early morning speed boat back to Santa Cruz and then transfer by land to Baltra for your departure flight. However, we don't blame you if you decide to extend your journey in the Galapagos! There is still exploring to be done in other Islands or on the mainland, visiting the spectacular peaks of the Andes or the lush jungle of the Amazon region! The Galapagos Magic Tented Camp is a tortoise camp, perched in the highlands of Santa Cruz and surrounded by a Scalesia forest and volcanic caves. This is the native habitat for wild tortoises, where you will be able to enjoy an intimate encounter with nature. The areas around the campsite are home to several dozen giant tortoises, seen roaming around property from June through February. During the months of March, April and May the giant tortoises generally move to lower elevations, though a handful sometimes remain, so keep your eyes out! Formerly the Red Mangrove Lodge, and located in Puerto Velasco Ibarra, the Lava Lodge is built entirely of pine wood from the mainland man made forests. This lodge is situated in front of the ocean, on a unique black lava surface. Ten independent small cabins are each equipped with one twin size bed and a bunk bed, which can host up to three people each. Each cabin has its own bathroom, front porch, reading and shaded area, to offer you privacy and enjoyment of the outdoors, as you observe the scenic sea views. 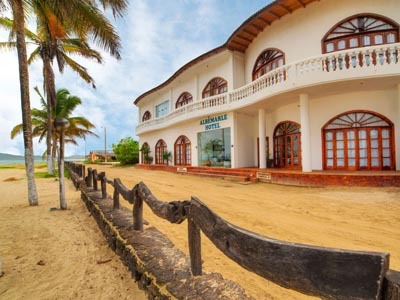 Located directly on the pristine white-sand beach of Galapagos' most beautiful and peaceful island, Isabela, Hotel Albemarle offers guests the chance to explore an array of natural wonders from the comfort of this family-run hotel. Relax on the rooftop sun terrace as the cool breeze passes, take a dip in the refreshing pool, or simply savor the comfort of your spacious room after your fun-filled days of adventure. This is just one of many authentic travel experiences offered by Global Basecamps. If you are interested in more unique destinations to Ecuador with unprecedented planning and extraordinary service visit our main Galapagos safari camp page to browse other sample trips.